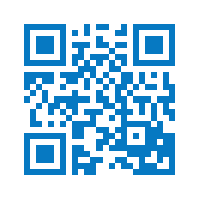 Get instant access to the region’s latest water news on your smartphone. 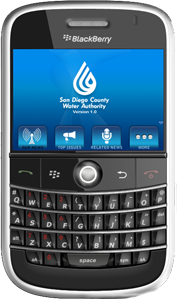 The app provides access to Water Authority news releases and top issues, video and multimedia features from our own Channel H20, a water-related news feed, access to Board agendas and documents, fact sheets, and more. 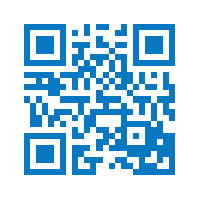 Currently, the app is available for download in the Apple, Android, and BlackBerry app stores. Note: The BlackBerry app is no longer supported but is designed to work on devices running 5.0 and 6.0 operating systems; exact functionality may differ between BlackBerry devices. Click on the video below to see a preview of the app! We hope the app will help you stay informed on key water issues. As with most mobile apps, you may notice a bug or two that needs to be worked out. Let us know what you think by submitting feedback, suggestions, or comments to our Facebook page, at info@sdcwa.org, or in the app store. Help us spread the word about this app by clicking on any of the “Share With a Friend” social media icons on the top right corner of this web page. Thank you for downloading! “Related News” - Provides a 24-hour feed of the latest water-related news articles found and filtered by Google News. “Settings” - Allows users to clear all red stars with one click, change which view opens on app launch, and turn push notifications on and off. Fact Sheets - Find information about water supply, water rates, capital improvement program projects, and many other Water Authority projects and programs. 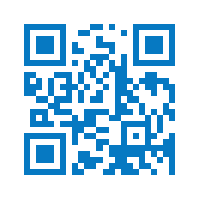 The app is available for download in the Apple, Android, and BlackBerry app stores. 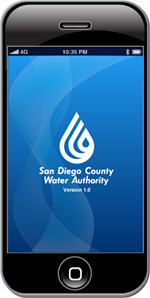 Visit your smartphone’s app store and search for SDCWA or San Diego County Water Authority, or scan the barcode from your smart phone on this web page. Note: The BlackBerry app is no longer supported but is designed to work on devices running 5.0 and 6.0 operating systems; exact functionality may differ between BlackBerry devices.